Over the past year, East Africa has seen an unprecedented flurry of political developments that are changing dramatically the political landscape in the region. 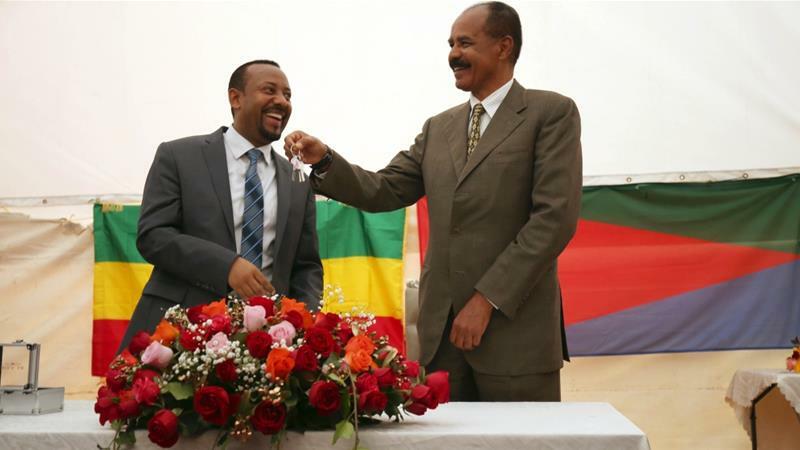 Eritrea has emerged out of its diplomatic isolation, signing declarations of peace and cooperation with Ethiopia, Djibouti and Somalia and publicly calling for the lifting of international sanctions. After years of hostility over the building of the Renaissance Dam on the Blue Nile, Ethiopia and Egypt have seen a significant improvement in relations. Sudan, too, has mended relations with its northern neighbour and has managed to get US sanctions lifted. Many have welcomed these new political developments with euphoria, believing that they mark a new dawn for East African politics. The Horn of Africa is indeed set for a significant departure from the past, but it is important to note that there are external factors behind these changes. Saudi Arabia and the United Arab Emirates (UAE) appear to be the sponsors of most of these diplomatic efforts, but their role too has been shaped by bigger players. The undercurrent to these changes is the major shift of US foreign and defence policy from the “war on terror” to strategic competition with other global powers, mainly Russia and China. Since the end of the Cold War, the “war on terror” has been at the centre of all US alliances in the world, including in the Horn of Africa. However, in recent years, the US has gradually come to perceive the rise of China and Russia, and not terrorism, as the biggest threat it is facing in Africa and elsewhere. It is in this context that Washington has sought to forge alliances with African forces to support its antagonistic competition with these two great powers. In March this year, General Thomas Waldhauser, AFRICOM Commander in Africa, warned the US Congress that China would threaten US interests globally and particularly in the Red Sea if it takes a key port in Djibouti. The Doraleh Port had been operated by UAE-owned DP World since 2006 but the Djibouti government broke off its agreement with the Emirati company and nationalised the port in February this year. According to Waldhauser, Djibouti has assured the US that it would not hand the port over to the Chinese, who set up their first overseas military base in Djibouti in 2017, but he warned that if it does, this would cut off supplies to the US military base in the country and restrict the movements of US Navy ships in the area. He further concluded that the US will “never outspend the Chinese in Africa” and he was in “the process of rewriting US military strategy in the region with China in mind.” Given the heavy economic and military presence of China in Djibouti, US interests shifted towards its neighbour, Eritrea, which could – in the future – host a new US military base and provide the US with access to its ports. For this to happen, Eritrea first had to emerge from its diplomatic isolation, especially by normalising relations with Ethiopia. To achieve that, the US launched a quiet campaign last year involving church officials and US diplomats lobbying the two sides to come together and resolve their differences. Soon after US senior diplomats and senators voiced official calls for normalisation of relations between Eritrea and all neighbouring countries. US allies Saudi Arabia and the UAE also played an important role. While the US diplomatic offensive succeeded in pulling Eritrea out of isolation, it left Djibouti out of the grand rapprochement it engineered. The shift in US priorities in East Africa has also introduced a number of other major changes in the region. First, it has further diminished the importance the US gives to supporting the armies of countries in the Horn of Africa, particularly that of Ethiopia. This means that the Ethiopian army’s role in regional security and foreign policy will diminish, with the exception of UN peace-keeping missions. Second, it has strengthened US support for the alliance between Egypt, Saudi Arabia and the UAE, at the expense of Qatari and Turkish interest in the region. This shift has also favoured the Egyptian army. In September, the US reinstated $195m in military aid to Egypt which was frozen last year over country’s dismal human rights record and relations with North Korea. The US has also given its blessing for a new role of the Egyptian military in the Horn of Africa. Third, this shift has also meant that the US government is putting more effort on the economic front, which could have diplomatic and economic implications. While the US realises that it cannot match the scale of Chinese investment in Africa, it is still looking to curb Chinese economic influence in the region. Part of its strategy is to encourage US companies to invest more in East Africa. In Ethiopia, this trend is already visible: while in the past US officials from the Department of Defense and the White House used to visit Addis Ababa, now it is officials of the Department of Commerce with entourages of US businessmen. Fearing reproach from Washington, some East African countries may scale down their ties with China and revise their public procurement procedures. Seeing this trend, China has already announced its decision to cut down investment in Ethiopia until its current debt payment is restructured. The US government is also looking to set up a special agency to invest up to $60bn to counter Chinese interests in the developing world, including East Africa. This signals that just as the US is pushing on the geopolitical front in East Africa, it might start doing so on the economic one as well. While the region needs to address its rising debt and dependence on China, the economic policies that the US would press for might not be in its best interest either. East Africa will need all the assistance it can get, be it from developed liberal states, from Gulf monarchies or Asian economic powerhouses. But as the competition between China and the US intensifies, it increasingly looks like this financial support will come with conditions. Therefore, countries in the region and the continent as a whole should resist unwarranted interferences in their internal policy decisions and insist on their sovereignty being upheld. If they succeed in this, they will be able to reap the benefits of the emerging economically competitive multipolar world order.